At last, a quality additive synth that doesn't require a PhD in Synthesis to program! Fun and easy to program. Huge range of sonic possibilities. Warm low end. Not the dirtiest sound around. High CPU use with complex patches. 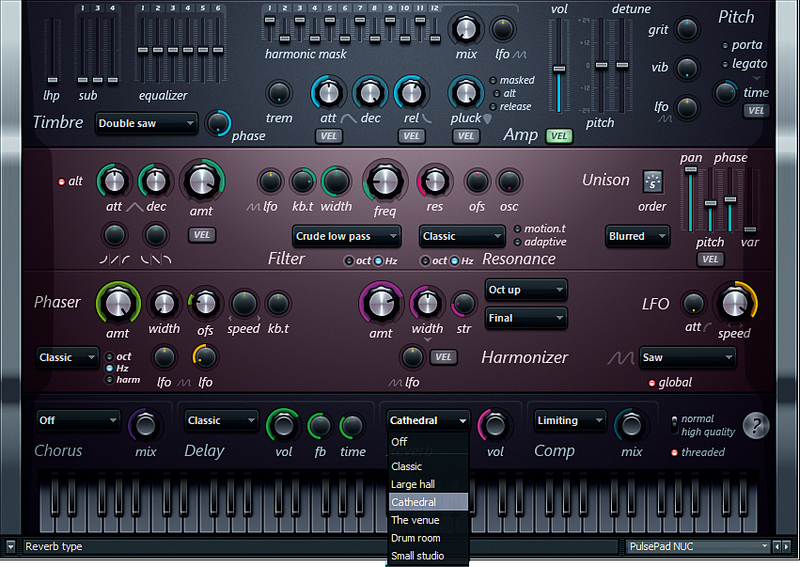 There are more flexible additive synths. Image-Line's roster of soft synths expands once again with Harmless, which is described as a 'subtractive-additive synth'. 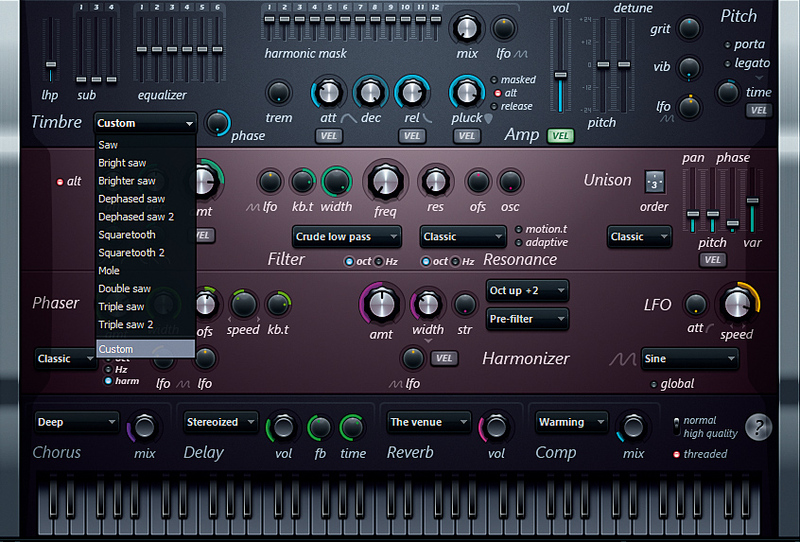 Put simply, it looks and acts much like a subtractive synth, but is in fact additive under the hood. The result is a synth that can produce sounds that simply wouldn't be possible using subtractive synthesis alone. For example, tone generation, filtering and phasing are all performed by manipulating the raw harmonics. This provides some unusual filter shapes, amongst other things. While there are more flexible additive synths on the market currently (such as Camel Audio's Cameleon 5000), Harmless's strength comes from the fact that it does a great job of opening up the world of additive synthesis to the more casual sound programmer by keeping the interface simple and intuitive. Sound generation begins in the Timbre section, where you can select from a range of waveforms or import and resynthesize single-cycle waves from audio files. If you're using Harmless with FL Studio, you can simply drag and drop sounds straight onto the Harmless GUI to be analysed. Most of the built-in waveforms are sawtooth variants - this makes sense, because a pure saw wave theoretically contains all harmonics, both even and odd. Thus, you can create many other wave shapes by removing harmonics. There are a number of options for shaping the sound, all of which are fairly novel. There's a harmonic equaliser, the bands of which follow the pitch being played, so that the first slider's band is always centred on the first harmonic and so on. There's also a sub-harmonic generator, for adding weight to sounds, and a Harmonic Mask section, which enables you to reshape sounds by subduing harmonics, or subtracting them entirely. A Pluck feature adds a fast-acting low-pass filter envelope to the timbre. This can be assigned so that either the Harmonic Mask or Harmonic EQ dictates the decay rates of their particular harmonics. The filter section works like that of a standard subtractive synth, but offers considerable flexibility in terms of filter shapes. What's more. the cutoff frequency can be set to a Hz or Octave scale, and the Resonance section features a wide range of different shapes, including an unusual Noise shape, which randomly selects harmonics to emphasise. The Phaser in Harmless is an integral part of the synthesis engine. Unlike a typical phaser effect, which uses phase cancellation to artificially create moving 'holes' in the frequency spectrum, Harmless instead creates such gaps by directly manipulating the harmonics that make up the sound. Controls include Width, Offset and Speed, and there's a variety of phaser types available: Classic, Triangle and Eggs are classic models; Deep, Deeper, Condom, Twins, Cascade & Box are special effects that exploit Harmless's additive synthesis engine; and Freq is a special effect that modulates the frequency of targeted harmonics. Harmless also has a range of standard effects. In keeping with the intuitive and ergonomic design, these are simple and neatly laid out, comprising a chorus, delay, reverb and compressor. Although fairly standard, the quality is good throughout, with each offering a variety of effects types, along with simple mix level/volume controls and, in the case of the delay, feedback and time parameters. The compressor is derived from Image-Line's Maximus multiband compressor/limiter. Here, tones can be compressed, limited or even distorted - this is great for creating more aggressive sounds. Surprisingly for such an uncluttered synth, there are many more aspects of Harmless' sound design architecture than we can possibly squeeze into this review, and it's a testament to the designers that, in spite of this, Harmless never feels like a chore to program. The presets are fairly standard and not especially inspiring, covering the usual basses, atmospheres and leads, along with some useful tutorial patches. As far as sound quality goes, this synth is unashamedly digital. There are no attempts to disguise the sound with analogue emulation effects or vintage-modelled oscillators. Having said this, though, we reckon it sounds clean and clear, not harsh or cold. "The synth really comes alive when you start experimenting with some of its more esoteric controls." The synth really comes alive when you start experimenting with some of its more esoteric controls. Tweaking the Phaser and Harmonizer soon becomes second nature, and enables simple sounds to be reshaped into complex, evolving textures - it's particularly good for early-'90s style dance leads. Although the synth has a surprisingly deep and warm low end, the overall tone of standard basses and leads is still usually very clean, so it probably won't be what you're looking for to pin down the bottom end of your dubstep or DnB productions. 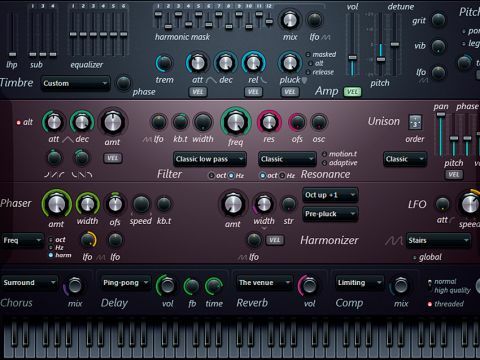 Where this synth really shines is in its ability to create a virtually limitless range of distinctive and unadulterated mid-range lead and melodic sounds. Almost ironically, it's the fact that Harmless's sound is so 'undisguised' and raw that makes it standout. The synth also offers normal and high-quality modes, as well as optional multithreading for improved performance on multicore CPUs. In general, CPU usage is low, although it can climb steeply with some of the more full-on patches. It should be noted that, while being capable of plenty of sounds that you'd never get out of a comparable subtractive synth, there are also many types of sounds that Harmless is simply not that well suited to. It would be unfair to dock points here, however, as the intention was clearly to step away from the well-trodden path, rather than give us yet another virtual analogue. While there are additive synths out there that offer greater depth of programming, it can be difficult to scratch the surface with them, and working with them can often feel more like a scientific endeavour. Harmless is a refreshing exception: it's invitingly tweakable, and it should appeal to sound designers and musicians looking for something a little different with the ease and functionality of a classic subtractive synth. The price is also rather attractive.